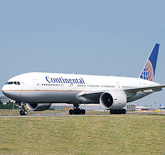 Continental Airlines has announced plans to launch nonstop flights between Newark Liberty and Cairo, Egypt, beginning May 18, 2011, subject to government approval. Cairo, the largest city in Africa and the Middle East, will be the 72nd international destination that Continental serves from its New York hub at Newark Liberty International Airport and the 30th city in Continental's trans-Atlantic route network. Continental serves more nonstop destinations with more flights from the New York area than any other airline. Cairo is the third new international destination Continental has announced since May -- the airline plans to begin daily service from its Houston hub to Lagos, Nigeria, beginning Nov. 10, 2011, and service to Auckland, New Zealand, beginning Nov. 16, 2011, subject to government approval.